Step by step guide to writing a causes solution essay. 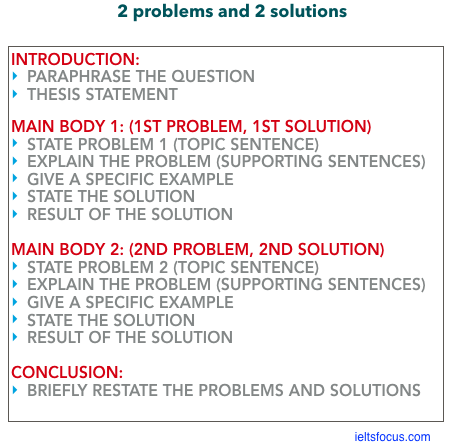 A common type of IELTS task 2 essay is the Problem Solution or Causes Solution essay. In this case I will need to write about the causes of the problem in main body one, and recommendations or possible solutions that could solve the issue in main body two. I could have a 3rd body paragraph but I prefer the 2 main body approach. 1. A good structure for a causes / problem solution essay. 2. How to analyse the question. 3. Tips on thinking of ideas for the essay. 5. How to paraphrase the question and write a good introduction. 6. How to build main body paragraphs. 7. How to write an effective conclusion. First, lets take a look at the structure that can be used for this type of IELTS essay. You can either write about 2 problems and 2 solutions, or just 1 problem and 1 solution as long as you develop and extend your ideas. Both are fine. There is no one particular magic structure that will guarantee a high band score though. How to analyse the question. This is the first thing that needs to be done before getting ideas or writing anything. Now lets look at the question. Call to action words/ instruction words: These words show what kind of essay you will need to write, there are 5 essay types and each structure is different. In this case the instruction words are: “what are the reasons for this?” and “how could it be tackled?”. I have to write about the reasons for the problem and how can the problem be solved. This is actually a causes solution essay. Tips on getting ideas for the essay. There are various ways to get ideas for an essay. I will list 3 types below. 1. Brainstorming: This is when you map out various words and ideas connected to the central topic, the key topic is in a circle and there are various connected circles and ideas. I don’t advise using this method because it takes too long and there will be too much information. I suggest about 10 minutes to plan an essay n the IELTS writing exam. In my opinion, don’t bother with this method due to time constraints. 2. Listing pros and cons or problems and solutions: This idea might work well for a problem solution essay or an advantage disadvantage essay but for the other types of essay it might not work very well. You just list problems on the left and solutions on the right. (I will use this method in this lesson.) but remember we only choose one or two problems and solutions to write about. 3. Asking questions to yourself: This technique is very useful for getting ideas quickly, remember that you don’t have much preparation time before writing. In this case you write a statement and ask yourself questions, like having a conversation with yourself. This works well for an opinion essay or discussion essay. I have listed some reasons for the problem and ideas for possible solutions. Causes of the Problem: Over consumption of fast food or ready meals. Possible Solution: The Government should raise tax on fast food. Causes of the Problem: Too much sugar and trans-fats in convenience food. Possible Solution: Government regulations are needed, put warnings on the packaging. Causes of the Problem: Lack of exercise due to a busy lifestyle. Possible Solution: Special incentives to join fitness clubs, company gyms, company events. Causes of the Problem: Gym membership and sports clubs fees are expensive. Possible Solution: Sports centres need to regulate their prices. Causes of the Problem: Unhealthy food is cheaper. Possible Solution: The food industry has to address the problem. Raise the price on unhealthy food, lower prices on fresh food, consult with local farmers. This took me about 2 minutes to list them, so now I need to select just 1 or 2 problems and 1 or 2 solutions and write about those. I do not need all these ideas, be selective here. Important: do not just write a list of problems in the essay. You have explain the causes of the problem and give specific examples and a suggestion for what action should be taken in the body paragraphs. You only need to write about 1 or 2 problems and suggest solutions. Don’t waste time brainstorming ideas or going into too much detail because you will not have time. Getting ideas quickly by asking yourself lots of questions. Basically, you have a little conversation with yourself to get ideas and then write some notes. Imagine you are with a friend and they are having a conversation with you about this topic. Keep it short though because you have to now think of paraphrasing the question and writing a thesis statement / outline statement. You do not need to be an expert on the topic, also you do not need to write your own personal opinion. You can just write any opinion and support it with specific examples. Another thing to bear in mind is the specific examples you give do not have to be accurate. For example, if I say “the consumption of fast food in the UK has risen by 24% since 2002 “ that sounds fine, but if I say “ it has risen by 98% “ then that just doesn’t sound believable. Tip: The IELTS test is not a general knowledge test. It is just designed to test your English ability and the way you can back up your arguments with examples clearly. Many students are scared and think their facts, opinions or statistics will be cross checked. The examiner is not going to check online to see if your facts or statistics are correct, they just don’t have time to do that. 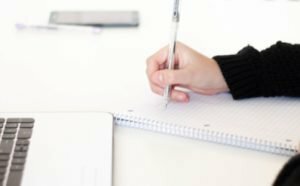 How to paraphrase the question and write an effective introduction. Now it is time to paraphrase the question for the introduction paragraph and add a thesis statement and outline sentence. Here is the question again. All over the world, societies are facing a growing problem with obesity. This problem affects both children and adults. What are the reasons for this rise in obesity, How could it be tackled? Nations worldwide are dealing with the increasing issue of obesity. This is a cause for concern for all age groups. These are the words and phrases that I have paraphrased using synonyms. Have you noticed that I didn’t paraphrase everything? … It is not necessary to change every single word, some key words like obesity or problem can remain the same in this case. Also I changed the phrase “All over the world, societies are….” to a much simpler “ Nations worldwide”. It’s not just about paraphrasing words with synonyms but the grammar can be slightly altered too. Now I need to state the causes of the problems and possible solutions in the Thesis statement. Keep the thesis statement short and to the point. Another method is to state the causes of the problem and refer to the fact that there are possible solutions to the issue, this means you will have a much more concise thesis statement. Example below. Remember: Your main body paragraphs will reflect the thesis statement so you must plan your thesis statement well. Here is the introduction in full. This introduction is around 54 words. Keep it concise, it is not necessary to have a long introduction. Do you need help with writing? How to build main body paragraphs. Now lets start building a body paragraph, I have chosen 2 key problems which are fast food and lack of exercise so I want to stick with those and not go off onto another topic. Do not suddenly change your ideas in the middle of writing you will lose time. Take a look at the idea below. Is there enough detail here? Is there anything missing from this paragraph? How can I improve it? The answer is that I need more detail and a specific example not just a general example. I need to explain what can be done to solve the problem. I can also write about what the result of the solution could be. One of the reasons that people are becoming overweight these days is that they are eating more junk food, ready meals and convenience food rather than cooking healthy meals at home. This is because many people tend to lead a busy life and after a long day at work it is easier to just buy ready meals in the supermarket or get a take away. For instance, In the UK, sales of these types of foods have risen by dramatically since 1990, this is due to busy people seeing cooking at home as time-consuming. To tackle this issue the government should take steps to increase tax on high fat, high sugar or unhealthy foods. Therefore consumers would think twice about the foods they consume, which could lead to them losing weight. Now I will use the same technique to write the main body 2 paragraph about lack of exercise. Another problem that needs to be considered is lack of exercise. As a result of leading a busy life or pressures at work, many people are just too tired to go to the gym or join a sports club. For example, after a hard day at work most people prefer to just come home and sit in front of the TV. It goes without saying that when people have time off, they tend to relax rather than going to a gym. One possible solution is for employers to consider the health and well being of their employees and offer in-house company gyms or special incentives, such as discounts to join a sports or fitness club. If this is implemented it would have a positive effect on peoples health and a reduction in weight gain. Problem : One of the main reasons for….. Solution: To tackle this issue….. Problem: Another problem to consider is…. Solution: One possible solution is…. Problem: One main cause for……. Solution: The way forward could be to…..
Another problem that needs to be considered is lack of exercise….. Therefore, consumers would think twice about the food they consume…..
As a result, this would have a positive effect on peoples health….. This would result in a reduction of obesity/This would lead to a reduction in obesity…. Something that is important for backing up your supporting points is giving specific examples , such as “In the UK sales of these types of food have risen dramatically since 1990” . You can give statistics but they are not really necessary. The examiner is not going to google your information and check , the point is that you can give examples. The aim of this is to show how you can use examples to back up your points. How to write a good conclusion. Now lets take a look at the conclusion. Here you need to summarise briefly the 2 problems and 2 solutions with a recommendation or prediction sentence. In conclusion, being overweight is an increasing issue because of consumption of fast food, convenience foods and lack of exercise due to work commitments. The government needs to look at taxing fast food and companies should set up incentives for gyms, sports or fitness clubs. Unless this issue is tackled soon, then the problem of obesity will lead to a higher mortality rate in the future. The last sentence is optional (the recommendation prediction sentence) but this is a good idea to include if you think the essay is slightly under 250 words. The conclusion should briefly repeat the main points you were writing about in the main bodies of the essay. Be sure to keep the conclusion short and simple, about 3 sentences is enough. You must write a conclusion, If you do not write a conclusion you will lose a Band score in task response. One useful method is to paraphrase your introduction in the conclusion. Examples of cohesive devices to conclude. Just choose one of these in the conclusion. Some words that should not be used to conclude are : All in all, Finally, Lastly, in the end, In a nutshell, I reckon… don’t use these, they are informal or are inappropriate. Nations worldwide are dealing with the increasing issue of obesity. This is a cause for concern for all age groups. There are two main causes, over-consumption of fast food and lack of exercise. Possible solutions would be a government tax on fast food and special incentives for gym membership to get people exercising. One of the reasons that people are becoming overweight these days is that they are eating more junk food, ready meals and convenience food rather than cooking healthy meals at home. This is because many people tend to lead a busy life after a long day at work it is easier to just buy ready meals in the supermarket or get a takeaway. For instance, In the UK, sales of these types of foods have risen considerably since 1990, this is due to busy people seeing cooking at home as time-consuming. To tackle this issue the government should take steps to increase the tax on high fat, high sugar or unhealthy foods. Therefore, consumers would think twice about the foods they consume, which could lead to them losing weight. Another problem that needs to be considered is lack of exercise. As a result of leading a hectic life with pressures at work, many people are just too tired to go to the gym or join a sports club. For example, after a hard day at work, most people prefer to just come home and sit in front of the TV. Furthermore, when people have time off, they tend to relax rather than go to a gym. One possible solution is for employers to consider the health and well being of their employees and offer in-house company gyms or special incentives, such as discounts to join a sports or fitness club. If this is implemented it would have a positive effect on peoples health and a reduction in weight gain. In conclusion, being overweight is an increasing issue because of consumption of fast food, convenience foods and not enough exercise due to work commitments. The government needs to look at taxing fast food and companies should set up incentives for gyms, sports or fitness clubs. Note: The essay doesn’t have to be this long, I did this for example purposes only, aim for around 260 to 290 words as you will not have the time to write a long essay in the exam. Remember that there is no magic structure that can guarantee you a high band score for an IELTS essay, you can have 1 problem 1 solution as long as it is well supported or 2 problems 2 solutions or a 3rd body paragraph. Just work with whatever you feel comfortable with. The essay must have an introduction and a conclusion though, and no more than 3 body paragraphs.